Is Fblthp really still lost if we can summon him using this card? I suppose there’s no way to be sure where he is before we call on him! 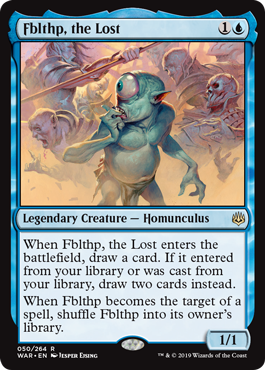 I’d love to know if Fblthp’s thing is just being lost somewhere in the city of Ravnica, or if he might eventually branch out. The Planar Bridge is technically in the city now, of course, so there might be a way for him to get somewhere else even if he never becomes a planeswalker. It’d be cool to one day see him stargazing in Akros, or standing on a dragon-headed longship’s prow! The meme has arrived. Everyone’s favorite directionally-challenged homunculus, Fblthp, finally makes his in-game debut with an interesting puzzle to try and solve. He’s normally a blue Elvish Visionary, but you get more cards if you can get him to play from your library…think Collected Company, Experimental Frenzy, a Protean Staff-style effect, or something close to it. And he also gets lost again rather easily, thanks to his “run to the hills” effect. By no means is Fblthp, the Lost a Constructed all-star, but he’s an interesting enough card that can get you a nice bit of card advantage in the process. Being a 1/1 with no combat abilities that can’t be hit by targeted pump spells is not a great place to be, but when you can let your memes actually be memes, who cares?